The debate over what was the first graphic novel rages on, with people typically giving credit to Will Eisner for popularizing the term in the 1970s, with his series of anthologies. Impressionistic, wordless woodcut narratives were published in the early 20th century, and Milt Gross's He Done Her Wrong, a cartoon narrative of Klondike gold prospecting, love, and betrayal, was published in 1930, but these works do not have the interactions between words and art that are a hallmark of graphic novels. Because of that distinction, It Rhymes with Lust, originally published in 1950, is considered by many to be the first actual graphic novel. This book was an attempt to capture an adult reading audience using the conventions of the widely popular comic book and pulp novel formats. The story contained within is not especially note-worthy, chronicling the machinations of a political boss and a conniving femme fatale named Rust Masson (whose name just happens to rhyme with lust) to wrangle control of Copper City. Caught in this web of political corruption is Hal Webber, a prototypical, cynical newspaper reporter trying to crack the big story while also fending off Rust's advances. Rust's stepdaughter, Audrey plays the role of the angelic woman who strives to win Hal over to the side of good. Also, there are lots of shoot-outs, explosions, and women wearing bed-time apparel (though nothing too racy). Drake Waller, the credited author of this work is actually two people, Arnold Drake and Leslie Waller. Drake was a noted comic book writer who told off-beat stories and created the characters Deadman and the Doom Patrol. Waller was a spy fiction author who also moonlighted as "Patrick Mann" writing novelizations of popular movies like Close Encounters of the Third Kind and Dog Day Afternoon. The art was provided by Matt Baker, an African American artist famous for his provocative drawings of the Phantom Lady and various jungle queens. Inking Baker's art was Ray Osrin, who worked for decades on various comic books before beginning a 30-year tenure as editorial cartoonist for the Cleveland Plain Dealer. Considered a precursor though not a classic, the book has received mixed reviews. Jon Mathewson points out the various cliches and flaws in the book but also notes that it held up well despite them. Ken Phipps at the Onion A/V Club wrote that it was "fun"and a "glimpse at what might have been" if such books had caught on in popularity. Brian Heater called it "a celebration of the height of low art." 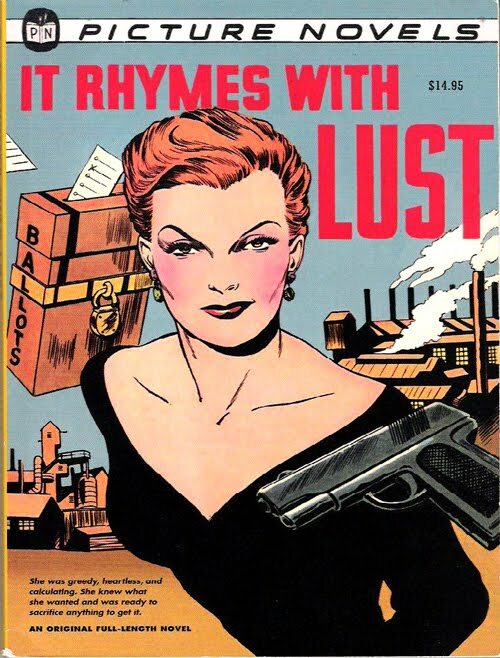 Out of print for decades, It Rhymes with Lust was reissued in 2007 by Dark Horse with a new Afterward by Drake and short bios of the creators. They offer a free preview here. A "nonfiction novel," In Cold Blood is a landmark work in that it brought nonfiction writing more into the literary mainstream and established author Truman Capote as a star. Additionally, it was an important work in the tradition/movement that came to be known as the New Journalism, which was most popular in the 1960s and 1970s. The plot of the novel follows the investigation and trial of two men with checkered and troubled pasts. After a bungled robbery that results in the brutal deaths of the Clutters, a family of four, who lived in rural Kansas, Perry Smith and Richard Hickock attempted to cover their tracks and flee, but were eventually apprehended and tried. That such a crime took place in a quiet and isolated small town created a stir and a sensationalistic news story. Through interviews, court transcripts, and local gossip, Capote amassed a mountain of information to craft the novel, his take on the situation. 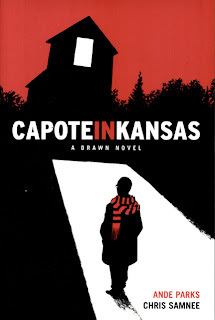 Capote in Kansas recounts the horrific Clutter family murders and the subsequent investigation but also offers a look at Capote himself. Capote came to the town because he felt the story would make for a powerful The New Yorker piece. The townspeople of Holcomb did not take to Capote and his urban bon vivant tendencies, and they treat him as an outsider. To remedy this situation, Capote calls in some assistance from his childhood friend Harper Lee (yes, the author of To Kill a Mockingbird) who helps to establish that he means well and that he can be trusted with their stories. Along with the events of the novel, the graphic novel also relates Capote's everyday life in Holcomb, including a relationship/dalliance with a local school teacher. Ande Parks wrote this "drawn novel," and Chris Samnee illustrated it. Parks works as a writer and inker and has done work with all the major comic companies. He is probably best known for writing a recent relaunch of Green Arrow for DC Comics. Samnee is a well-published artist who has also been busy producing works for all the big comics companies. His use of negative space and shadows makes for some very evocative scenes in this black and white work. This graphic novel has been well reviewed, with most people being divided about how fact and fiction are intertwined. Colleen Mondor writes that Parks "has created a piece of art with Capote in Kansas" in her very thoughtful review of the book. Lee Atchison called it the "stand out comic" of the year. Another positive review comes from Gary Sassaman. Hilary Goldstein admits it may be better received by people who have read the novel first but thinks it would be "enjoyable" to others who had not as well. Gillian Flynn at Entertainment Weekly was not so kind. A 5-page preview is available from the book's publisher, Oni Press. 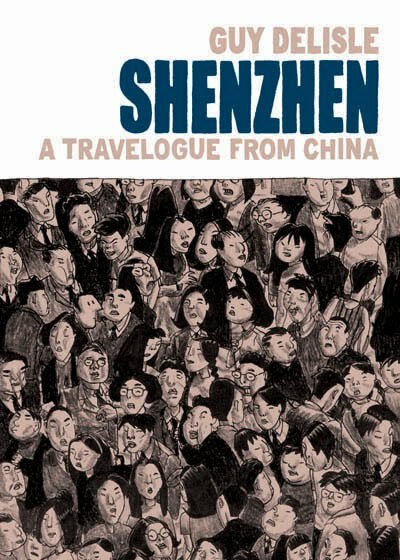 The second illustrated travelogue from Guy Delisle, Shenzhen is a record of the artist/animator's trip to the large Chinese city neighboring Hong Kong. Shenzhen is a growing metropolis that attracts many people looking for employment and opportunity, and Delisle was there for three months in the late 1990s to supervise a team of animators. Delisle's descriptions of the city are sometimes harsh, pointing out the filth and omnipresence of government propaganda, but they also include very human observations about local food, entertainment, and constant construction projects. One of the overwhelming feelings the reader gets from his accounts is that he felt pretty isolated and lonely in China. As I noted in my entry on Pyongyang, Delisle is an illustrator and animator who travels the globe for his work and also to accompany his wife who is involved in Doctors without Borders, so he gets around to some very interesting places. He is a Canadian and his primary language, as you can tell from his blog, is French. This interview sheds some more light on Delisle's feelings on his trips to China and some of the decisions he made in creating this travelogue. Shenzhen is generally well regarded, and it was nominated for a Wright Award for Best Book in 2007. 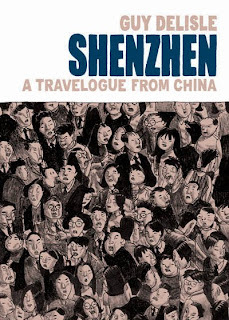 Paul Karl Lukacs writes a thoughtful review of the book and also notes that he had very different experiences and that Shenzhen has undergone large changes since Delisle's time there. Renee, President and Publisher of Shen's Books, called it very realistic and felt Delisle's experiences were very similar to her own. Reviewer Danya David says that despite its flaws, Shenzhen is a "fast and interesting read" and suggests it may be a good addition to an 11th or 12th grade history or government class. A preview is available from the publisher Drawn & Quarterly. 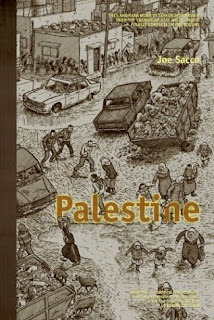 Palestine is the first major collected work by Joe Sacco, a journalist who draws the events and people he encounters in different hot spots of the world. This books casts a spotlight on the people whose side we usually don't hear about in the US, telling the story of Palestinians who live in the West Bank and the Gaza Strip. Sacco was there in December 1991 until January 1992, and his motive for creating this work was to add balance to the coverage of the events in this area of the world. He felt that all the news reports he saw were told from the Israeli point of view, and he wanted to see what the other side looked like and had to say. The people he met were largely hospitable, drank tea, and were not all monsters or terrorists. However, they did have many stories about the foul deeds perpetrated on them by Israeli forces. After reading these accounts, it seems that neither side is entirely in the right in this conflict, to say the very least. Palestine was originally published as separate issues from 1992 on and collected in 1996. In 1996, the series also won an American Book Award. It was reissued in 2007 as a special edition with an introduction by noted international scholar Edward Said. In general, this is a very well reviewed work. Josh Flanagan at iFanboy called it one of the best comics of the decade. The Observer's David Thompson offered the opinion that "Sacco's greatest achievement is to have so poignantly depicted contradiction, oppression and horror in a form that manages to be both disarming and disquieting." The Independent's Charles Shaar Murray wrote that "It's a powerful piece of work" but also noted there was a uniformity to the depictions and "few of his Palestinian interviewees emerge as 'characters.'" A short preview is available from the book's publisher, Fantagraphics. A longer slide show preview of the special edition of the book is here. 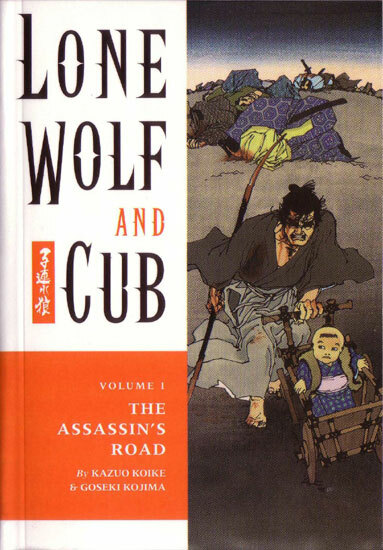 A landmark manga, Lone Wolf and Cub tells the tale of Ogami Ittō, the shogun's executioner who is framed and disgraced into exile with his infant son. A killer pushing a baby carriage is a jarring image, and it is set up by a choice. After the deaths of the rest of the family, Ittō offers his young boy two items: a ball or a sword. If he chose the ball, he would be sent to be with his mother (i.e. killed) but if he chose the sword he would go on the journey for revenge and retribution. As you can tell from the title, he chose the sword. This volume shows the beginning of their quest and sets up Ittō's actions as an assassin for hire who wanders 17th century Japan. The pair find many takers for their services, with bandits and thugs preying on people across the land. Scenes of revenge and violence abound even when they are not hired for a job. Ittō is shown to be full of wisdom and also as invincible as a force of nature, and his son Daigorō is surprisingly alert, composed, and responsive for being so young. Kazuo Koike, the writer, is a prolific author of manga and novels. He began his career as a writer for the popular series Golgo 13 and also went on to create and write the popular manga Crying Freeman. He began Gekika Sonjuku, a college course for manga creators, and his graduates include some notable figures. The other half of the "Golden Duo" responsible for this hit work was artist Goseki Kojima. He drew mostly samurai stories but was a big influence on other artists, notably Frank Miller. Both Koike and Kojima received the Hall of Fame Eisner Award in 2004. This series was originally published from 1970 until 1976 in Weekly Manga Action, a publication that has been coming out since 1967. It was wildly popular then, with the magazine selling upward of 8 million copies per issue. The story was also adapted into 7 films and 2 separate television series in Japan. In the US, all 28 volumes are published by Dark Horse. Lone Wolf and Cub has influenced a number of other works, notably the recent Road to Perdition graphic novel and movie in the US. Long considered a classic, it has been well reviewed, such as where David Brothers wrote that "the first volume does an interesting job of setting up the story and providing a hook." A few more reviews are linked here. A preview of the first volume is available here. A debut graphic memoir, The Impostor's Daughter tells two stories. One is how Laurie grew up with her larger-than-life father, a college professor who had a great many stories to share. He was quite accomplished and experienced in his tales, from his days dealing with political unrest in Peron-era Argentina, to his exploits as a Green Beret in Vietnam where he won two Purple Hearts and a Bronze Star, to his earning multiple Ph.Ds from institutions like Columbia and NYU, to writing position papers for Henry Kissinger. The second part is how Laurie dealt with such an overwhelming male presence in her own relationships, especially when she began to unravel that all of her father's stories were lies. Laurie Sandell is an active reporter and a contributing editor for Glamour Magazine. A particular specialty of hers is interviewing celebrities. The impetus for her memoir can be found in this Esquire Magazine article. She has drawn all of her life, albeit not so much professionally. 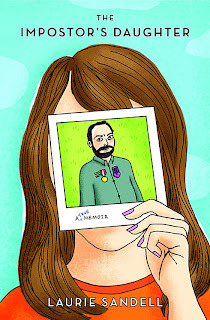 This work is her first foray into graphic novels, and her art style is very clear and simple. Perhaps because of her publishing connections, Sandell's book has been widely, and for the most part positively, reviewed. John Hogan wrote that he "fell in love with this book and its raw honesty. It's gut-wrenching and compelling. "Likewise, Bermuda Onion gushed that she fell in love with this book and could not put it down. Greg Burgas provides a different opinion, opining that he found the book "unfulfilling" because it was so shallow in its treatment of a potentially great story. For more opinions, a great number of reviews from agencies such as Kirkus Reviews to Publisher's Weekly can be found here. For more information about Sandell and this memoir, check out this interview from ABC News or this interview with Doree Shafrir. A preview is available here from publisher Little, Brown and Company. The first book in a trilogy set in Essex County, Canada, Tales from the Farm contains the story of Lester, a 10-year-old orphan who lives with his uncle on a farm. Isolated and with no other company than his laconic uncle, Lester starts wearing a mask and cape and escapes into a fantasy world. He befriends Jimmy Lebeuf, a huge man who runs the local gas station, when Jimmy slips him a free comic book. Jimmy used to play professional hockey but an injury has left him a changed person. The two play pond hockey, talk superheroes, and fight alien invaders (!) until his uncle forbids them to hang out any more. Tales from the Farm melds fiction, biography, and fantasy. The art is done in black and white and is spare, scratchy, and evocative. Its creator Jeff Lemire has won a slew of awards, including a Shuster Award, the Doug Wright Award, and the American Library Association's Alex Award for Adult book with teen appeal. Currently, he is working on the series Sweet Tooth for Vertigo and is writing for DC Comics. In terms of reviews, they are mostly positive, with most criticisms coming about Lemire's sketchy art and slow pacing. Aaron Albert said that the book "is a touching story about growing up, loss, and finding ways to cope with the hard times." Leroy Douresseaux called it "a broad universal tale with which many young adult readers may identify." Nisha Gopalan likened it to an "indie film" and said that "patient readers will appreciate this Podunk comic's languid pacing and stark, jittery visuals." More information about the Essex County Trilogy can be found in this review by Wes Walcott. More information and news about Jeff Lemire's work can be found in his blog. A preview is available from the publisher Top Shelf.